On arrival, you will find private parking available in the courtyard. Entering the property through fabulous timber doors, you meet a traditional pathway, at the far end of which lies the main living/dining area, with a casual sofa area around an elegant marble coffee table, in front of the satellite TV, complete with a Netflix subscription! At one end of the room, the large dining table can seat up to ten, and custom artwork creates a traditional ambience. A fully-equipped, air-conditioned kitchen provides the perfect space in which to rustle up a meal or two – unless you'd instead our in-house chef did the work while you put your feet up. Indeed, with a private villa manager and an on-site maid too, you'll likely find you needn't lift a finger at all! All four sublime and air-conditioned bedrooms are located at the rear of the villa, around a tropical Thai garden centrepiece. There are two double rooms with king-size beds and two twin rooms with two super single beds each. All include a fitted wardrobe, walk-in closet, ceiling fans, elegant teak flooring and incredible ensuite facilities. Three also have a writing desk, while two have a satellite TV. All four ensuite bathrooms have marble flooring and include both indoor and open-air showers, while the master bedroom also features a large bathtub for two, and each is equipped with 100% cotton bathrobes and slippers and an array of luxury toiletries. The large garden of exotic, tropical trees and plants weaves throughout the whole property, creating a stimulating ambience. Overlooking the pristine beach below is a private lawn area, from which a small gate leads you to the beach itself. 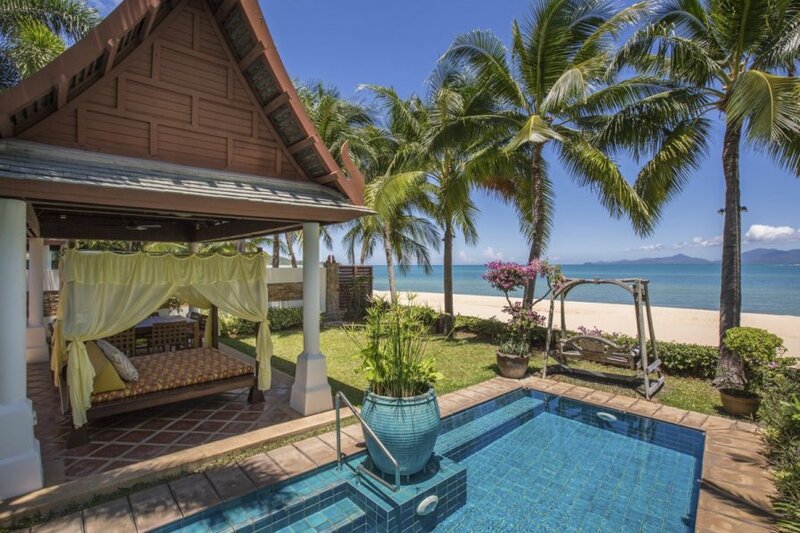 A traditional open-air Thai Sala, equipped with Bluetooth speakers, massage bed, dining table and chairs and a gas-fired BBQ, overlooks the lawn and beach, offering the perfect place to relax in the warm afternoons, in between dips in the refreshing pool. The 16x3 meter private pool has sun loungers at both ends, as well as vibrant underwater lighting to make it indeed come alive at night. Dividing the garden and the house you will find an outdoor bar area complete with a sink, fridge and stereo and a casual seating area of sofas and sun loungers. All just a short stroll from the beautiful Mae Nam village where you can find restaurants, bars and a whole range of spas and leisure activities. Villa Wattana is located on the tranquil Mae Nam beach, a five-kilometre stretch of palm-lined, pristine white sand famous for its glorious sunsets.